Some people never drive a car, some never travel by public transit, many never fly, but almost everyone is a pedestrian at some point. Pedestrian safety is a critical piece of the transportation safety picture and Attorney Greg Brod is proud to serve as a pedestrian accident lawyer in Oakland, San Francisco, Santa Rosa, and other Northern California communities. In today’s post, we look at a tragic series of fatal pedestrian accidents in the Bay Area in recent days. We then move to the national level and take a look at who is involved in pedestrian crashes plus when and where these tragedies occur. Understanding accidents is critical to preventing accidents and serving our clients after a tragedy strikes. Recent weeks have seen a number of fatal pedestrian accidents in the San Francisco Bay Area. The San Jose Mercury News reports that Interstate 880 near Highway 237 in Milpitas saw at least two fatal pedestrian accidents within a week’s time. CHP personnel told reporters that a man was hit by multiple vehicles and killed when he tried to run across Interstate 880 on November 1. Another accident occurred on the same road on November 6 around 5:10 PM. According to the paper, a 65-year-old man was trying to cross the freeway’s southbound lanes just south of Dixon Landing Road. In addition to the two pedestrian fatalities, a motorcycle rider was also killed in the same general area on November 3. Despite the spate of accidents, Milpitas was not the local community to see a pedestrian death in the past two weeks. According to the San Francisco Chronicle, a woman was hit and killed in Walnut Creek on the morning of Monday November 9. The Chronicle reports that a driver ran a red light at Treat Boulevard and Candelero Drive, hitting a pedestrian in the crosswalk before broadsiding another vehicle and coming to a stop in the intersection. The incident occurred around 7:50 AM and, after being taken to the hospital, the 56-year-old female pedestrian passed away at 9:15 AM. Police are reportedly looking into whether the wet weather played a role in the tragedy. In February, the National Highway Traffic Safety Administration (“NHTSA”) released its annual Traffic Safety Facts: Pedestrians report based on data from 2013. Overall, the agency found that 4,735 pedestrians died and 66,000 were injured due to traffic crashes nationwide in 2013. This works out to one pedestrian death every two hours and one pedestrian injury every 8 minutes. According to the NHTSA, the average age of the pedestrians who were killed in the U.S. during 2013 was 46. The report found that 5% of pedestrian fatalities were children age 14 and younger while 19% were people over the age of 65. Looking at the age issue from a different angle, 14% of all traffic deaths involved pedestrians, but 21% of all traffic deaths involving children were pedestrian deaths, making it critically important that we focus on child pedestrian safety. 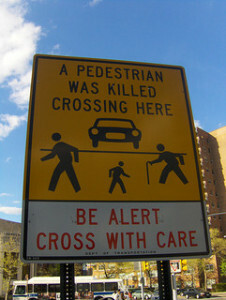 Males made up a whopping 69% of pedestrian deaths. Another notable fact: Approximately 36% of pedestrians fatally injured in traffic accidents had blood alcohol content levels of 0.08 or higher. The NHTSA found that nearly three-quarters of pedestrian fatalities in 2013 occurred in urban areas. Further, approximately 69% of the fatal crashes occurred on roadways when the pedestrian was not in an intersection, 20% involved a pedestrian in an intersection, and 10% involved other locations like parking lots, sidewalks, and shared-use trails. A total of 72% of fatal pedestrian accidents occurred in the dark. Overall, 6 to 8:59 PM was the three-hour period that saw the highest percentage (26%) of pedestrian deaths. Interestingly, the NHTSA found that pedestrian fatalities tended to occur earlier in the day during fall and winter than during spring and summer. Pedestrians should always obey traffic rules and should make every effort to travel in well-lit conditions. That noted, pedestrians are always at the mercy of drivers and their safety is dependent on the behavior of every driver they encounter. When driver negligence leads to a pedestrian tragedy, we help the injured and/or grieving hold the driver legally accountable and ensure the victims recover the compensation they need and deserve. Remember, as we’ve discussed in previous posts, the law does not demand a plaintiff’s perfection so pedestrians may be able to recover compensation even if they made mistakes. Call our San Francisco/Santa Rosa/Oakland pedestrian accident lawyer and arrange a no-cost consultation to learn more.